George Lucas and Steven Spielberg have always been very clear that the character of Indiana Jones was rooted in the adventure films and serials of their childhood and that they were paying tribute to their matinee heroes by creating a new one of their own. From time to time, I’ll take a look at those silver-screen adventures from the 1930s through the 1950s, both classic and forgotten, as we delve into the stories that influenced Indy. This week, Cary Grant stars in George Stevens’ 1939 classic, Gunga Din. To my knowledge, the people involved directly with the creation of Indiana Jones have never come out and explicitly revealed in any depth exactly which films, serials, comics, etc, spawned the character we love so much (trust me, I’ve searched for such a list); this is probably because Indy comes from many sources, and is likely more a style of film than any particular films themselves. That being said, I’ve selected Gunga Din for this first entry into Indy’s influences because a) the film is still easily accessible, which is something that I’ve discovered can’t be said of most of these old adventure movies, and b) its influence on the Indiana Jones film series is blatant. It’s not just between the lines; it’s EVERYWHERE. Based very loosely on an 1865 Rudyard Kipling poem of the same name, Gunga Din depicts the jingoistic pride of the British Empire during the 19th Century occupation of India. It’s the kind of story that stops to say “for king, for country” every five minutes, and even though no one ever ACTUALLY says those words, you know they’re thinking it. Kipling’s poem focuses on a lowly Indian water bearer named Gunga Din as he heroically and selflessly carries out his duty of keeping the British army from getting too thirsty at great risk of personal injury (it’s almost a caricature of patriotic devotion). Wisely, the film instead relies on three soldiers (Cary Grant, Douglas Fairbanks, Jr., and Victor McLaglen) whose sense of loyalty to each other is just as strong as their sense of loyalty to their country. Tell me if the plot of Gunga Din sounds familiar: our trio of protagonists are in India, far from home, surrounded by elephants, snakes, and unforgiving terrain that’s difficult to navigate. Soon they cross paths with an ancient, murderous cult known as the Thuggee. The Thuggee worship Kali, the goddess of blood, and are led by a bald high priest who believes that soon Kali’s faithful servants will destroy those who don’t believe and eventually will take over all of India. 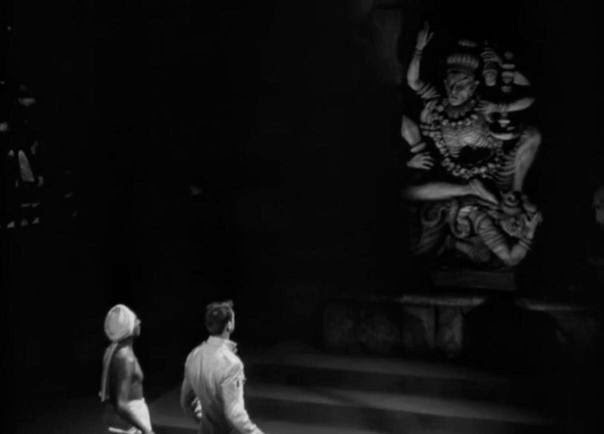 Along the way, our three heroes face assassins, are captured and held prisoner in the temple of Kali (which contains a huge idol of the goddess), and must eventually escape to safety over the long rope bridge that is just one machete cut away from dropping them to certain death. They say it’s a thin line between homage and theft, so I’ll leave it to you to determine which this is. George Lucas bears most of the credit (or blame, depending on your point of view) for Indiana Jones and the Temple of Doom, and I think it’s pretty clear that George is a Gunga Din fan. I can’t blame him, because the 1939 adventure is SO MUCH FUN. It’s almost two hours long, but feels like half that; it covers a lot of ground and moves that quickly. I’ve really come to appreciate the movies of the 1930s and 1940s for having a specific tone and quality that’s easy to invoke but hard to master. You know that pulpy, anything-can-happen feeling that the Indiana Jones movies have? It’s the same feeling that Stephen Sommers’ The Mummy has, and it was born in movies like Gunga Din. This time period is often called “the golden age of adventure,” and it really was. Our heroes are three dimensional and flawed. Cary Grant is outstanding as a cockney soldier who loves fighting and drinking. Victor McLaglen is the spitting image of English actor Ray Winstone (or the other way around), which I only bring up because Winstone was in the fourth Indiana Jones film. McLaglen’s plays the tough guy with a heart of gold, and if he and Winstone weren’t separated by 70 years, I’d swear they were the same person. Douglas Fairbanks, Jr. has slightly less to do, and is the soldier who is going to be retiring from service soon in order to get married and settle down with his own tea business. He has just days to go before his relief of duty when the Thuggee rear their heads; he’s like Danny Glover in the Lethal Weapon franchise: time is never on his side. Joan Fontaine is given the absolute bare minimum as Fairbanks’ fiancé, and is relegated to waiting for his adventures to be over so the can finally marry and live the quiet life. She needs more to do in the film. The film opens with a pretty spectacular battle between the British and the Thuggee in the village of Tantrapur, and the adventurous tone is immediately set. There are massive gunfights that take place in the streets and buildings of India, sticks of dynamite flying and things blowing up left and right. We’re treated to fist fights, gun fights, and sword fights, and I’m pretty sure that the actors are shooting real guns with live ammunition in some of the scenes: for example, when Victor McLaglen shoots the lid off a box of dynamite, he takes several REALLY authentic looking shots. Maybe I just buy into the movie in the same way that I buy into the casting of Sam Jaffe. I also thought the film had wonderful location cinematography in India and the Himalayas until I read that the entire movie filmed in California. 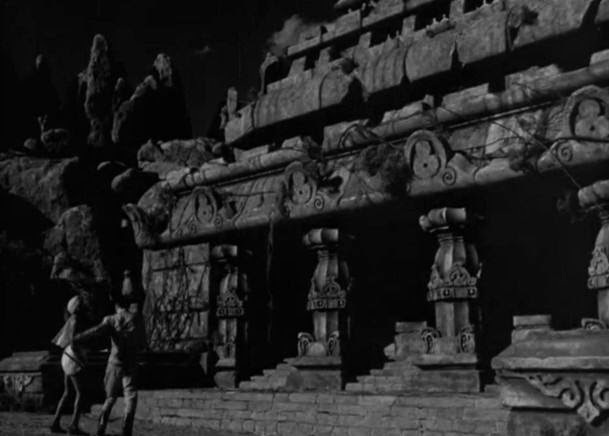 I love how dark Gunga Din goes; when Cary Grant and Din venture out into the middle of nowhere in search of a temple made of gold, they find a truly haunting place filled with worshipers of death. I try to put myself in the mind of someone watching this movie in 1939: Howard Carter had discovered the tomb of King Tutankhamun only 17 years earlier, global travel was more accessible than ever, and the world was shrinking. The British Empire, which had existed for hundreds of years, was in its final days. The world was on the cusp of a second global war, and the times were undoubtedly frightening. That’s why I love how Gunga Din ventures into some dark territory, yet never strays too far from a defiant, fun-loving mood, and our protagonists laugh in the face of death. It’s worth mentioning that the movie is consistently funny, often in wry ways that make me laugh out loud. Howard Hawks was originally scheduled to direct the film, and he and future-Nobel-Prize-winning author William Faulkner started working on the story in 1938, but he lost the gig after his film Bringing Up Baby received a tepid reception. George Stevens was brought in as his replacement. The scope of the film was wide, and it cost almost 2 million dollars. 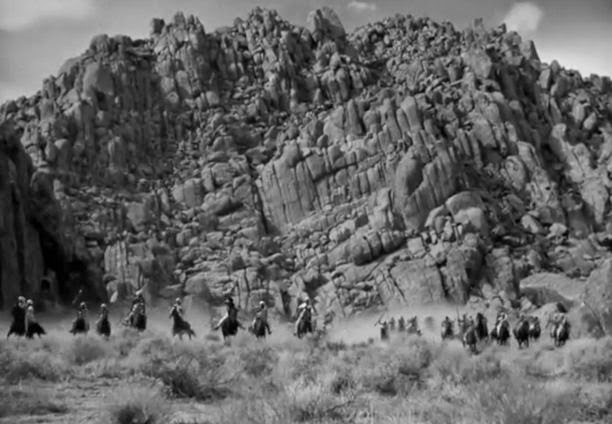 There are as many as 600 extras in some scenes, but Stevens manages to keep the film grounded in adventure and excitement without it venturing into epic territory. There’s no lush, sweeping score, and there are no long, lingering shots of our heroes. The movie maintains a brisk, fun pace and never takes itself too seriously. There’s a story that reflects the casual approach of the film, which says that Cary Grant and Douglas Fairbanks, Jr. flipped a coin to determine who would get the lead role. Fairbanks lost the toss, and Grant took top billing. 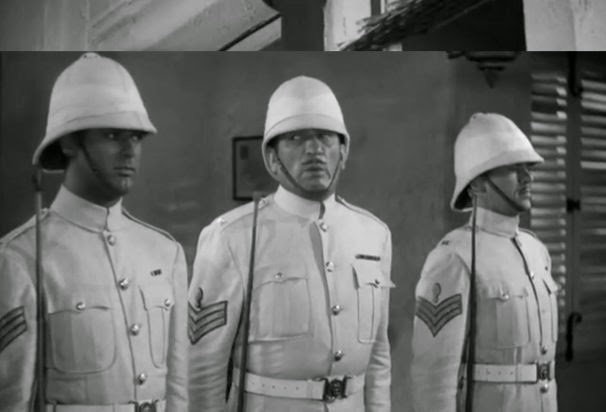 Gunga Din has understandably been accused of a lack of political correctness and sensitivity. After the movie was released, there were reportedly riots in India and Malaya over religious insensitivity. It’s worth noting, though, that the Thuggee were a real cult. Their name translates from the Hindi as “thief” and for 600 years they roamed across India, befriending unsuspecting travelers, whom they strangling and robbed before burying the bodies in the sand. They were finally destroyed by the British army in the 19th century, making the movie not entirely inaccurate. True, the film romanticizes the English occupation, but I find it best not to look to adventure films of the 1930s for accuracy and responsibility. We’ve hopefully come a long way since then, and viewing the movie through the lens of historical context is a must. In case I’ve minced my words, I’m a BIG fan of this movie. Gunga Din is a ton of fun, and has had a long-reaching influence. Cary Grant is a lovable good-timer who doesn’t have everything figured out, and Victor McLaglen is a tough guy with a heart of gold. Douglas Fairbanks is…um….well, he’s not important to what we’re talking about. It’s easy to see how both Grant’s and McLaglen’s characters and their adventures against the evil cult of Kali in Colonial India would have made an indelible impression on George Lucas all those years ago because it still makes quite an impression today. I'm gonna have to check this movie out. I love adventure movies, and they're a really rare breed these days. Every now and then we get a glimmer of what they used to be (like John Carter or maybe even National Treasure) but they're dying out to make way for action and comic books. As a kid I grew up with big family adventures, like Spielberg movies and even those Homeward Bound movies where telepathic dogs and a cat go on a cross-country expedition. I hate that that genre faded off. 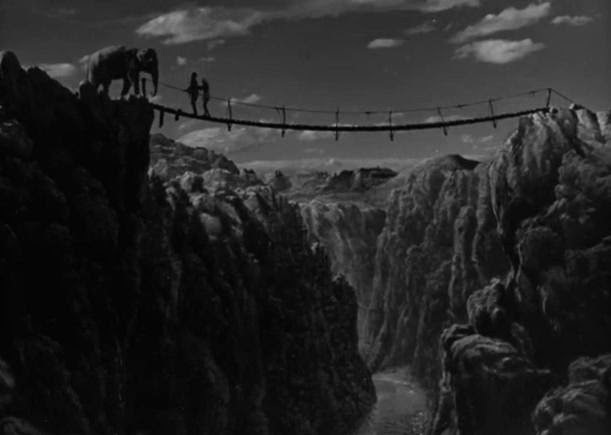 I've been meaning to delve into some of the classic adventure films as therapy for this hole in my heart, and this one looks like a good place to start. I'm with you, Andy. I hate that the adventure movie is on the decline these days, but there are thankfully a TON of them from years past. I think you'll have a good time with Gunga Din. Heath cool write-up for a classic film. Gunga Din is a true classic and one that I have not seen in such a long time. I can remember watching it along with Zulu (1964), and the Man Who Would Be King (1975) many times as a elementary school aged kid with my Dad. Not sure what that says. I have also read that another inspiration for Indy was "The Stranglers of Bombay" (1959). I watched it during SCM, less classy than ol' Gunga Din; more of an adventure/horror picture but it tells the story of a couple East India Company men battling the Thuggee Cult. Might be worth tracking down if you are feeling Thuggee or Imperial. 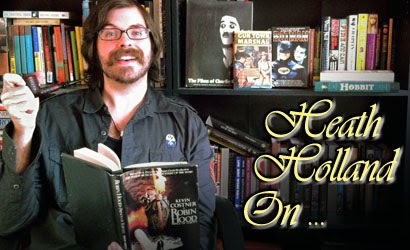 I think I will make a double feature for myself this weekend out of "Gunga Din" and "The Man Who Would be King". Forgot to add, "The Stranglers of Bombay" (1959) was directed by the one and only Terence Fisher for Hammer Films. Excellent! I would love to know what you thought of it.